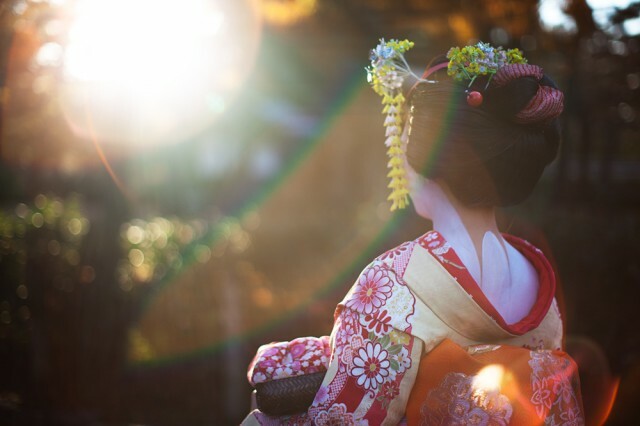 Seeing as it was my birthday this week I thought why not live dangerously and do what every tourist who comes to Japan does – visit Kyoto and make a beeline for its famous pretty bits. Crazy right? If you’ve been following for a while, you’ll know this project is all about the ‘unfamous’ and having to search for beauty (well, okay, the Marais in Paris wasn’t exactly a challenge, nor Trastevere in Rome, but otherwise…). 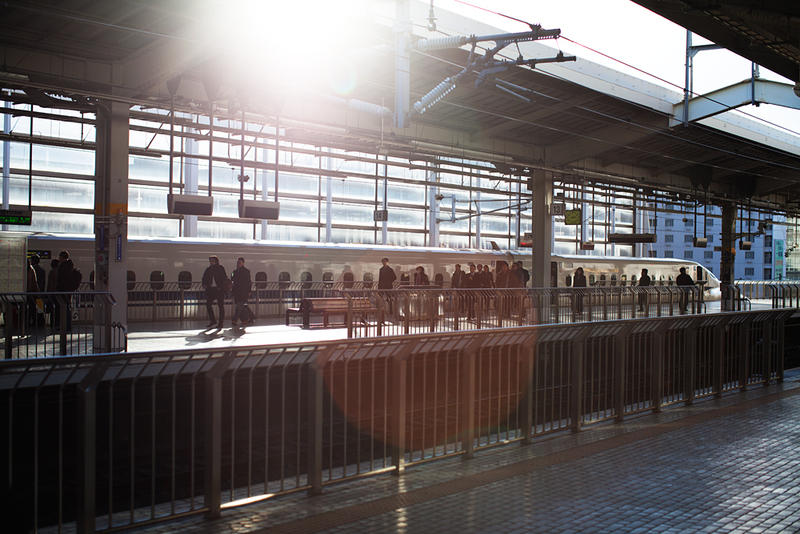 It started well with a fun trip on the shinkansen, AKA bullet train, but I had a minor wobble as soon as we arrived when I spied the crowds of tourists and, yes, queues. I am not good at queues. 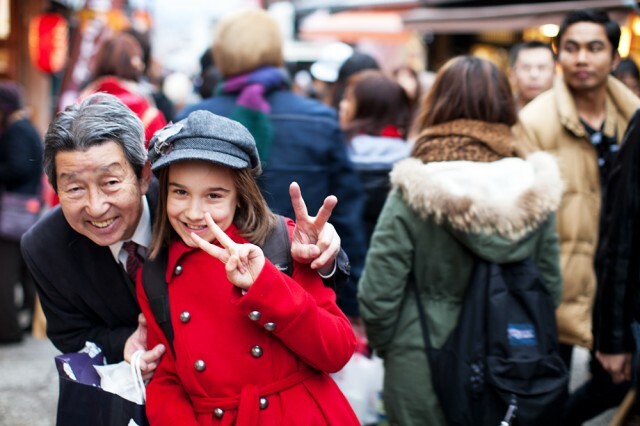 But it turned out that 99% of the tourists were Japanese. And call me something or other but I don’t mind hanging out with other tourists if they’re from their own country. Then it’s more like observing locals at play. Oh, whatever. It was weird doing the ‘famous’ but it felt even more odd not to see it and not to show you. The only real hiccup was that having decided to play tourist, I didn’t actually act like one – I was hopelessly under-researched and had no Top Ten list in my back pocket. Instead, we did what we normally do – chose one area to explore and no more. As a result, this is very much, here’s one part of Kyoto with a few shots of Japan’s most famous temple from another part thrown in. First there was the train. Well, more like a plane really. 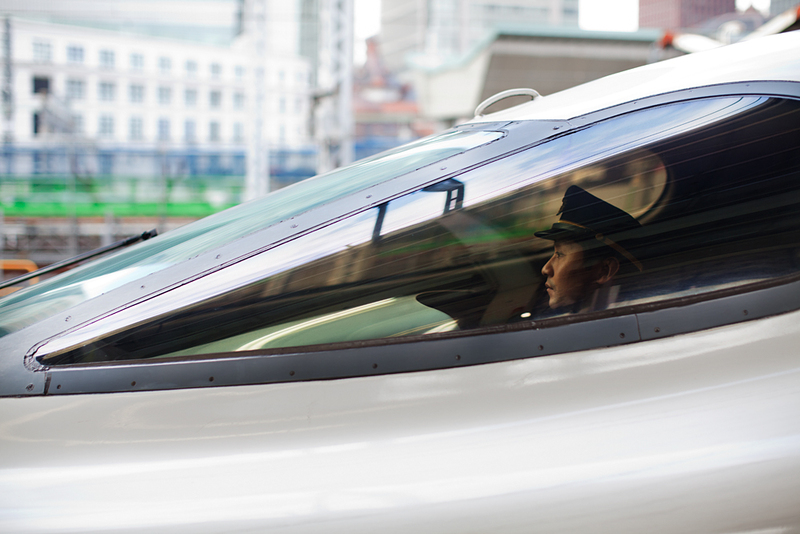 Travelling at 300km an hour, the Nozomi shinkansen 700 series delivered us from edgy Tokyo to ancient Kyoto in just under 2.5 hours. All year we’ve rented apartments. Most fine, a couple great, one woeful (when the cockroaches started walking across my computer it was time to go). But we were only going to be staying in Kyoto for two nights and, you know, it was my birthday. So I managed to wrangle a swish hotel room for the two nights at ‘media rates’. The hotel, the Hyatt Regency, was beautiful and really, who doesn’t love having their bed and breakfast made for them. But what made it extra special was that they organised for us to hang out with Tsubo-san. Job description – driver. But as I said, we didn’t do much dashing around. Instead Tsubo-san walked around with us for the afternoon, playing games with Coco at the same time as enlightening me about all things Japanese. 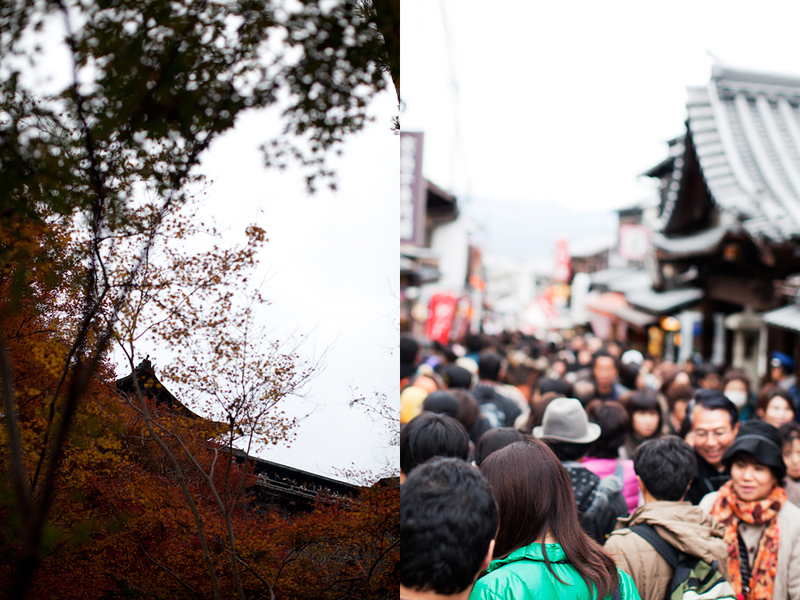 We spent most of the afternoon visiting Kiyomizudera Temple in Higashiyama, the old part of Kyoto. 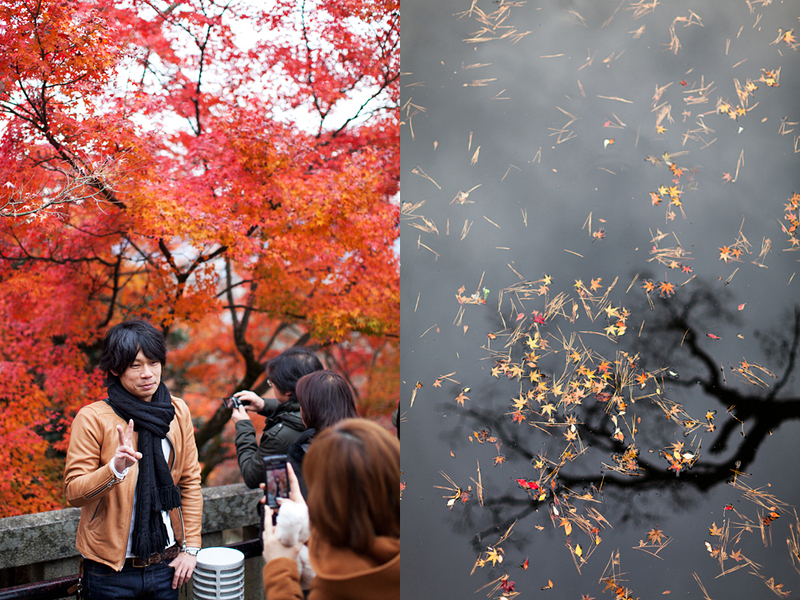 Just us and a zillion Japanese, keen to see the autumn leaves before they took to the ground. After Kiyomizudera Temple we headed north to Kinkaku, the Golden Pavillion, also known as Rokuon-ji Temple. But with night falling as well as rain – and Coco tired and cold – we only stayed for a second. Just long enough to wonder how much the pure gold foil that covers the top two stories must be worth. 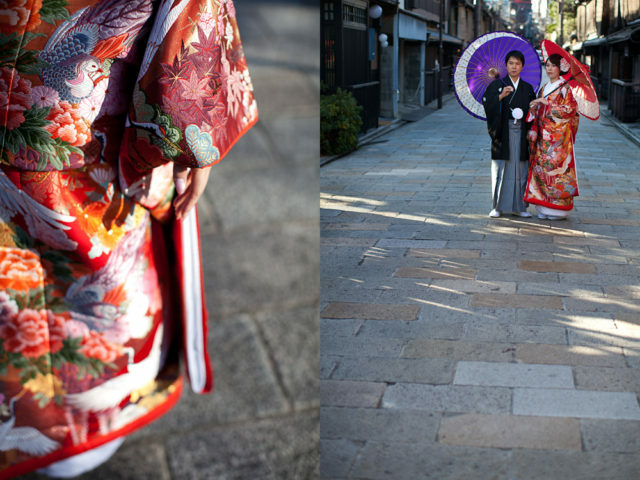 Aside from being peak Momiji-gari (autumn leaf viewing time), it also seemed to be peak wedding shots time in Gion, the famous geiko (geisha) district that’s part of Higashiyama. Tsubo-san had told us about the white wedding hat women traditionally wear the day before. 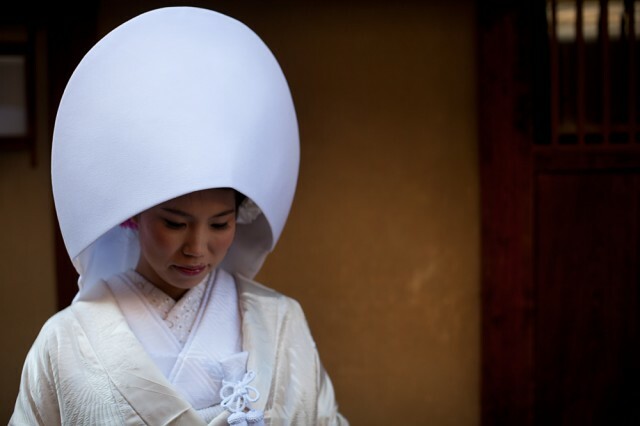 So when we pitched up in Gion and spied 26 year old Asami in her wataboshi, we knew why she was wearing a large white envelope-type covering over her head. Because she had horns – all women do – and she needed to hide them. Being kimono mad, I loved the wedding version. But I really love the head gear. When the photographer’s assistant helped Asami take it off, I spied the mechanics – the white material is held up by a simple wire structure that fits around the head like a halo. After leaving them for the final time we met several other wedding couples, all dressed in their finery. Kyoto was clearly the city of lurve. 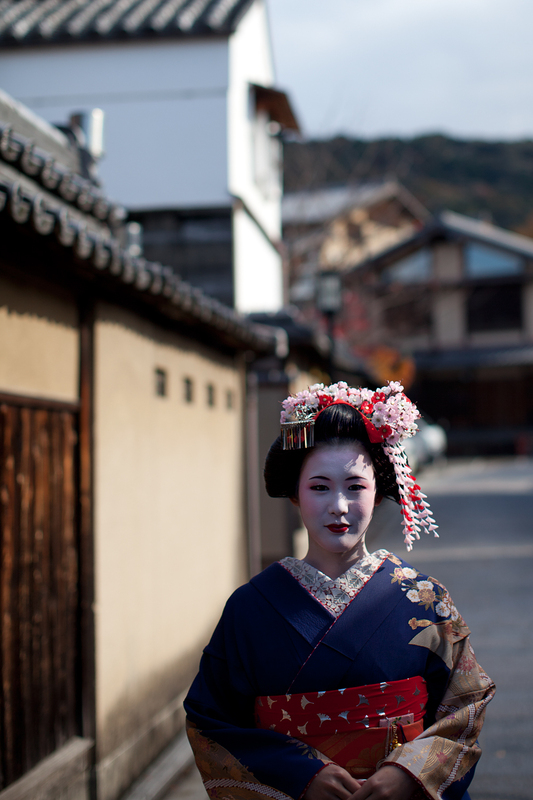 There’s one street in Higashiyama where people hang around in the hope of seeing a real geisha (called geiko in Kyoto, or maiko if they’ve got their L plates on) fly into a taxi or nip into a restaurant. But knowing it was hit and miss and with so little time, I didn’t even try. 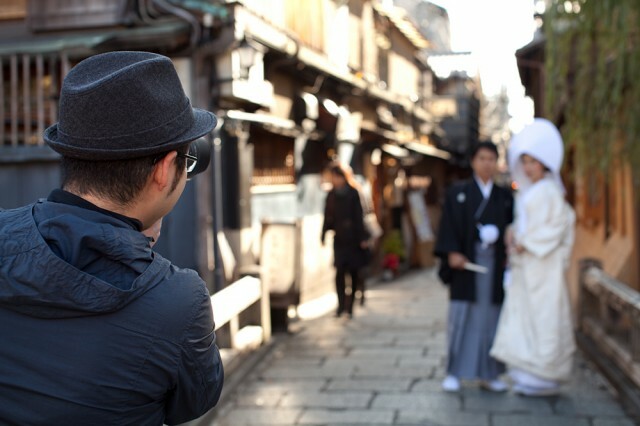 And really, I was almost just as happy snapping the ‘geisha tourists’ – Japanese women who generally were spending just a day in Kyoto, paying up to 10,000 yen (around AUD$120) to be made up and dressed in geisha style. 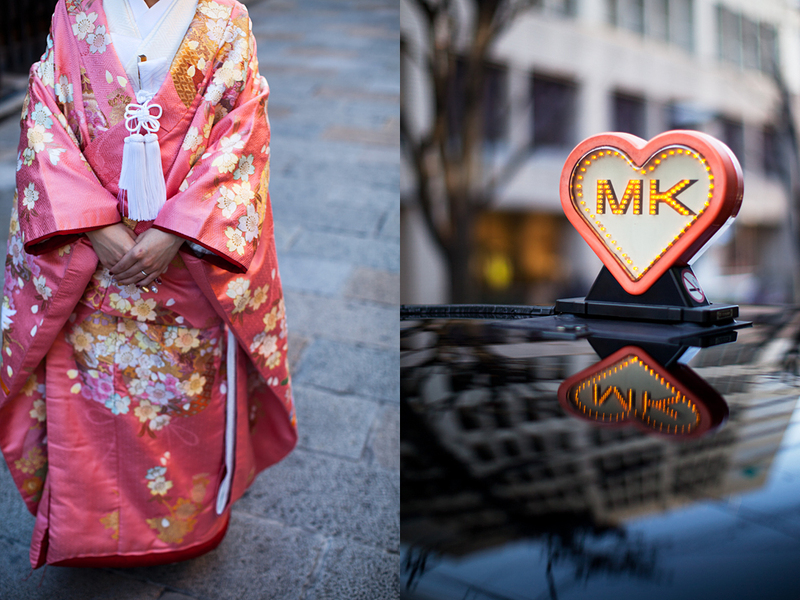 Like the woman below, whose name I couldn’t get because I had precisely two seconds to shoot her before she was dragged off by her small team – I assume they get a lot of people mistaking them for the real thing and they’re over being bothered. With Yuika and her friend, Hitomi, I had a few minutes more before their two assistants ushered them off. Unlike the others, they didn’t have any assertive assistants hanging around them. They were quite happy wandering around by themselves, taking their own snaps. Short and sweet though it was, I loved our few days in the ancient capital. 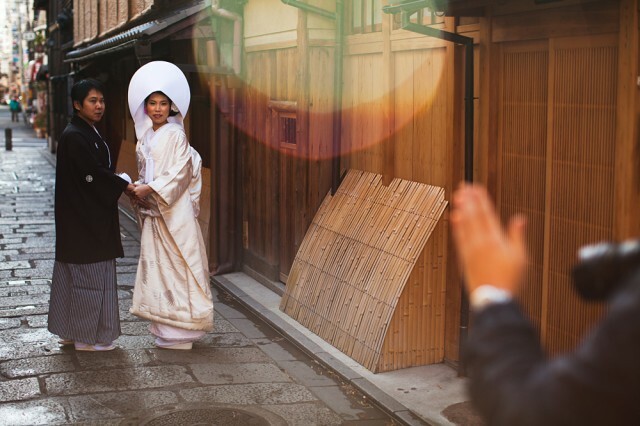 I know there are those who criticise the Japanese government for not keeping more of old Kyoto – aside from a few other famous bits, Higashiyama is really it – but at least they kept what they did. 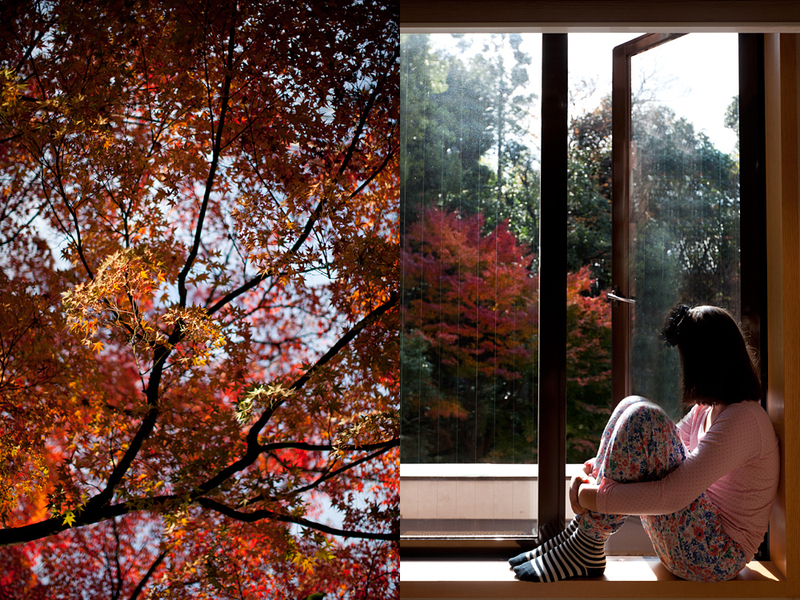 It was enough to provide a break from full-tilt Tokyo. Many thanks to the Hyatt Regency too, not only for providing a lovely room in a very stylish hotel, but for introducing us to Tsubo-san, a lovely man with a great sense of mischief and a mind full of fascinating facts. But it was quick. So much so that when we got back, Coco told me she thought Kyoto seemed like a dream. I’m not so sure though – even if we’d stayed much longer, it might still seem like a dream. Especially during Momiji-gari. 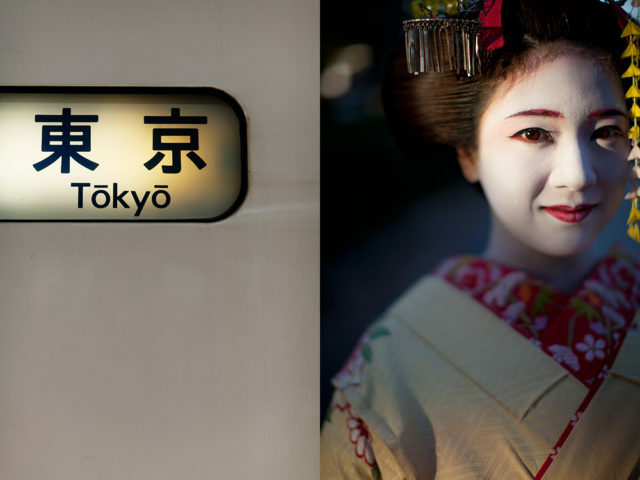 Dream or not, it was a lovely way to celebrate a birthday – although my actual birthday was spent back in Tokyo, wandering around Shimokitazawa again and eating cheap but excellent Indian at Spicia. Now, the next post is going to be an even shorter one and it’s going to be very soon! Like tomorrow or so. Just that I have nine more neighbourhoods/suburbs to do and not that many weeks before I’ve got to get Coco back home and into school. And yes, there’s that small thing called a budget too. It’s getting smaller by the minute. It’s such fun to tag along on your wanderings! Gorgeous photos as always. Coco looks absolutely Japanese in the last photo. For some reason, I cannot picture her sitting still in a classroom after this incredible year. Ooo, love it. And that you managed to get to Kyoto was a very pleasant surprise. I went to Kyomizu-dera in the summer, but boy do your autumn photos look spectacular. Never got to ride a Nozomi. 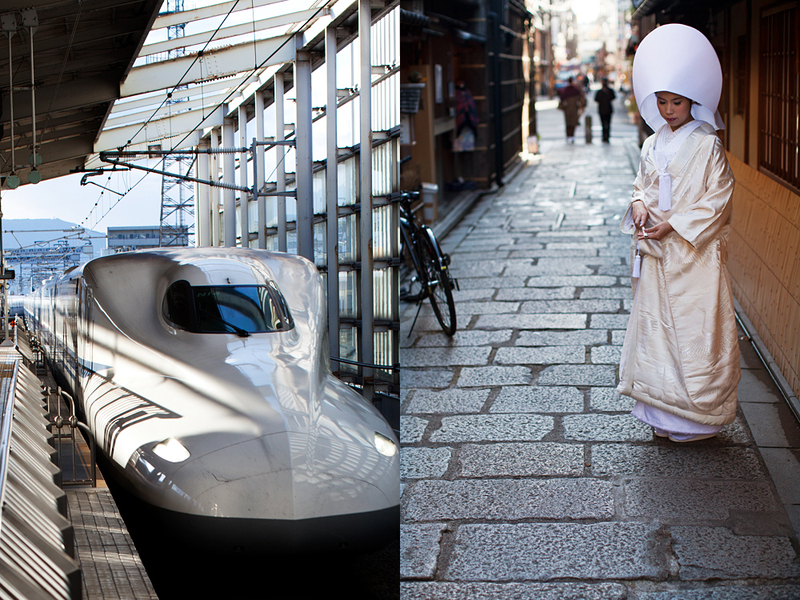 I went with a rail pass, which can’t be used on the fastest shinkansen, only the slower Hikari and Kodama. Lovely pics again Louise. I’m glad you managed to get a quick break for your birthday. Happy belated birthday Louise. Another lovely post about Japan…I can’t wait to go there now. The photograph ‘Last Light’ is my absolute favourite from this post…beautifully captured. Jann – Yes, it will be interesting to see how Coco takes to school life again after this! She’s so flexible it wouldn’t surprise me if she just slots back in. At least that’s what I’m hoping. Gretel – Funny. But like I say, at least all you hear is Japanese – it would really break the spell to hear loud American/Irish/Australian/whatever accents while standing there. 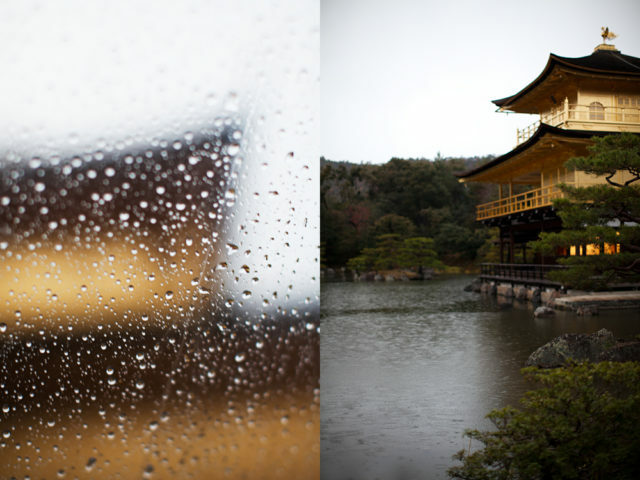 Joel – I did say we went to Higashiyama and a famous temple from “another part” – Kinkakuji was that other part! 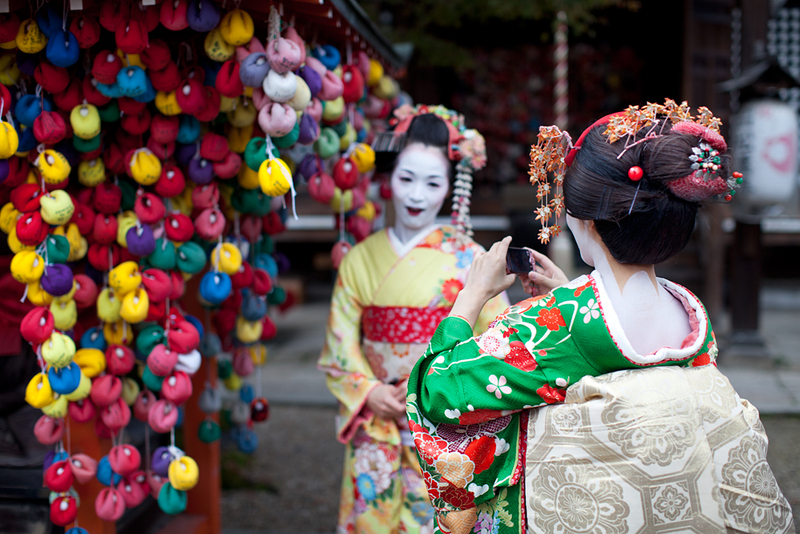 Next time you make it to Japan, I recommend the Nozomi if you can swing it – very cool. And quick! 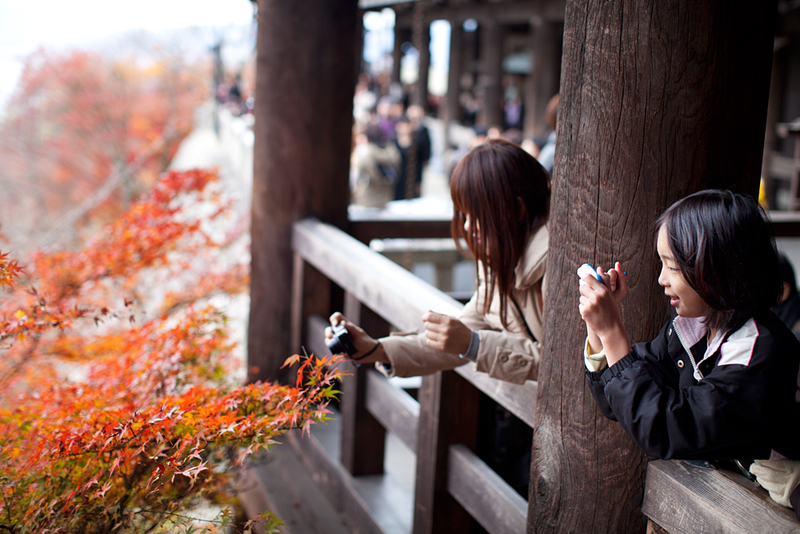 Steve – I never worry too much about my birthday so it really was special to be somewhere like Kyoto. Very lucky. Ellen – Like I said, Tokyo apparently has small earthquakes all the time – since we’ve been here I’ve felt at least three – but last night’s earthquake was much bigger and it did get me thinking! Kylie – Arigato! Really hope you make it here one day, such a wonderful country. Lovely images. My fav, “Patchwork”. I looked for a photo of a rock garden at a Zen Buddist temple- alas not there.There is a rock garden with 15 small rocks within a rectangle and a viewing area to the side of it. No matter where you sit you cannot see all 15 rocks at once. It has meaning in that from wherever you sit in life, you cannot see the whole picture. I’ll have to look it up on the web. 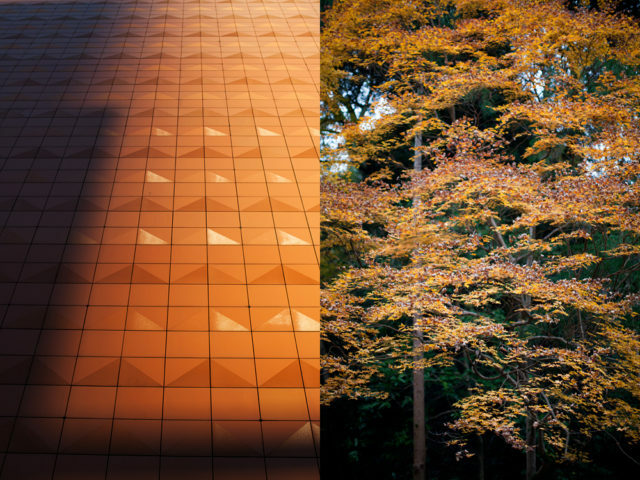 you’ve always shown such lovely work, but as i’m biased toward all things japanese, i especially treasure these recent posts of yours. gorgeous shot of the water surface strewn with autumn leaves. i hope someday i get to purchase prints of yours! Your photos are, as always, inspiring. 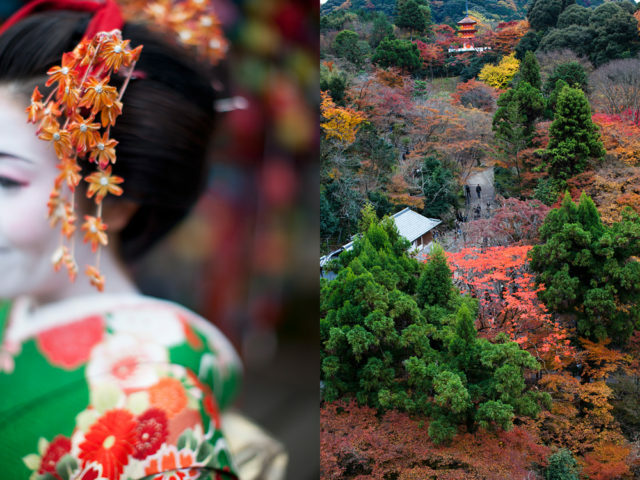 I’m planning to visit Kyoto next year, so getting another angle on an area I’m likely to visit is fantastic! Exquisite Asami…you captured her delicateness Louise. All lovely though. newer model. 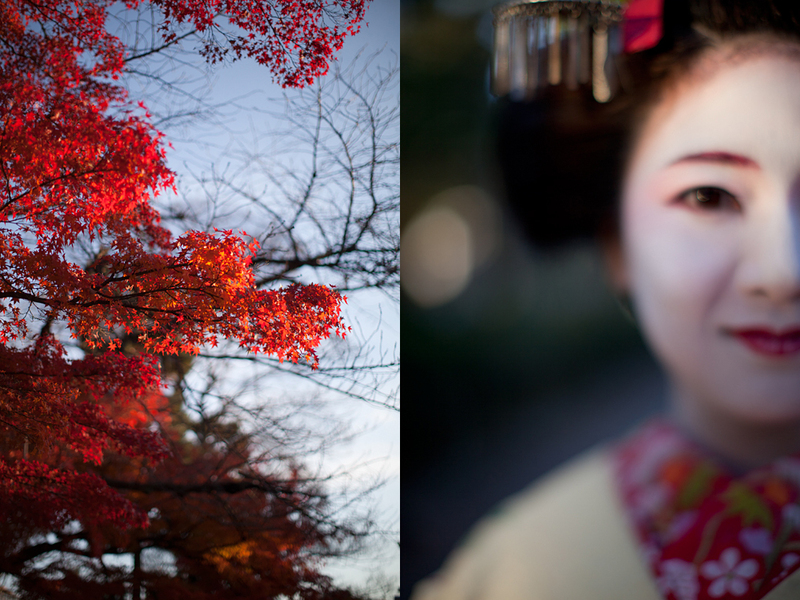 The Geisha dress-up was so pretty and the photographed autumn leaves a dream. You will always remember this birthday! HAPPY BIRTHDAY TO YOU !!!! ….gorgeous images ….that white head-dress is amazing …beautiful week again Louise…. 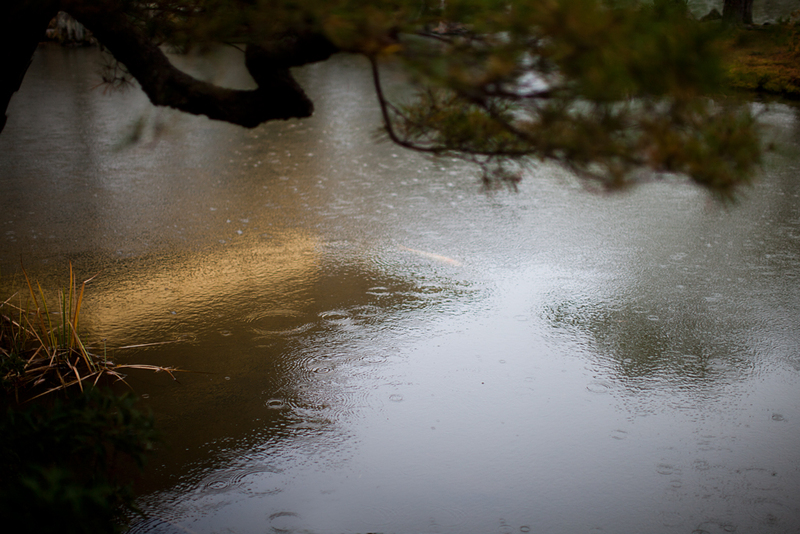 Fay Thomson: The temple you’re thinking of is Ryoan-ji – it’s actually fairly close to Kinkaku-ji. The meaning is that you can see all fifteen stones once you attain enlightenment. Thanks all for your birthday wishes! As Jackie says I’ll always remember this birthday. It’s interesting that people wished the Japanese government had kept more of old Kyoto. We found it quite charming and tranquil. I also say nostalgic even though I am not Japanese. The city has its old and traditional areas and the newer parts seem to have a 1950s feel to us. The buildings have very low height restrictions and there is not all that overwhelming neon famous in Tokyo and Osaka. Your photos are wonderful. 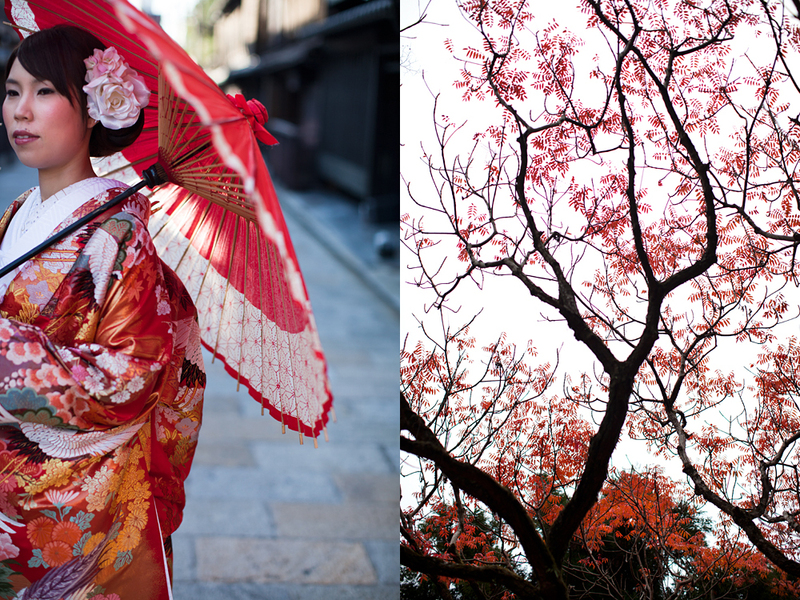 I think Kyoto could be a wonderful subject for your typical photologues of the beauty of everyday life. 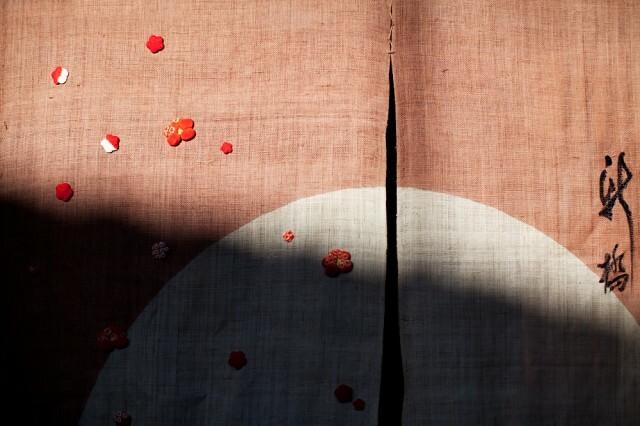 For us, Kyoto is Japan. I think the thing that saves Kyoto, even if a lot of the old stuff has been replaced, is that building height restriction you mention – and I think that’s what makes it still feel ‘older’ than it is. We spent so little time there though, so I’d really like to go back and explore it fully. And see it in the snow! That would be a sight. Very glad you enjoyed my images too, thank you.